The Strider Snow Cup has been dubbed the “Toddler Tour de France” by the Wall Street Journal, ESPN and others. A world leader in teaching young children to ride and rip on two wheels, Strider Bike has announced Buck Hill, in Burnsville, Minnesota, will host the Snow Cup on March 2nd. Toddlers ages five and under will shred the bunny slopes on their Strider 12 Bikes outfitted with the Strider Snow Ski accessory for a day of snow-filled fun. This family-friendly Snow Cup program is an extension to Striders events, offering a much different climate for two-wheeling toddlers to ride in. After numerous successful Strider Snow Cup events held across the globe, including Russia, Japan, and the United Kingdom. This event at Buck Hill marks the first Strider Snow Cup in the United States since 2013. Using Strider’s accessories the Strider 12 Balance Bike can be converted for use in the snow. This makes riding year-round fun and in any climate a reality. Snow Cup attendees can expect an atmosphere of fun and encouragement. As toddlers put their Strider skills to the test, the atmosphere will make for unforgettable video and photos. Pre-registration for the Strider Snow Cup is required. Each child that registers receives a Strider Snow Cup bib, Strider goodie bag valued at over $50, and a single-day use lift ticket to Buck Hill for their parent or guardian ($45 value). Registration is $36 and now open at www.StriderBikes.com/BuckHill. October 4-5, 2019: NASCAR Hall of Fame, Charlotte, North Carolina (Strider Cup World Championship). No qualification is necessary to participate in a Strider Cup or Strider Cup World Championship event. Registration for the May – October 2019 races will be available January 2019 at www.StriderBikes.com. Dates and locations subject to change. Strider creates and inspires future generations of riders by giving children as young as six months old the best first-bike experience. Strider Bikes revolutionized the bike’s design to develop a child’s balance first and pairs each balance bike with a proven learn-to-ride process. Children across the globe are starting out on a Strider Bike and becoming two-wheeling virtuosos – before they’re out of diapers. 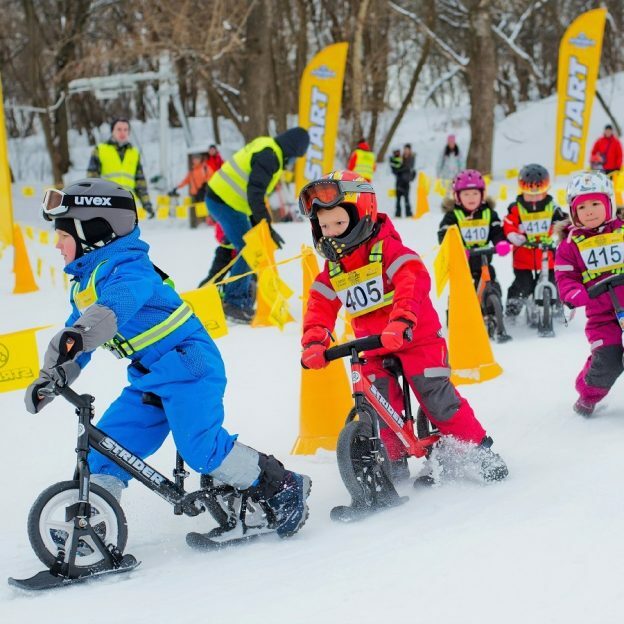 This entry was posted in News and tagged Buck Hill, Burnsville MN, more kids on bikes, Strider 12 Balance Bike, Strider Bikes, Strider Snow cup, Toddler power, Toddler Tour de France on November 25, 2018 by Russ Lowthian.